In a peaceful place in the heart of the village of Mouazé located a few kilometres from Rennes, on the historic route of Le Mont-Saint-Michel, La Peuterne allows you to enjoy natural sites and cultural places of one of the most prestigious area in France for your holidays or a weekend. La Peuterne, a traditionally built farmhouse, offers in an authentic setting, comfort and tranquillity in a room decorated in an old barn attached to the main house. For your well-being you can relax in the large garden, on the south-facing terrace or under the oak. For relaxation, you can enjoy the garden that will allow everyone, children or adults, to gather around the tennis table… or rest in a deckchair. For the book lover, a library with its numerous books and a piano, adjacent to the bedroom, is available. For the convenience of families, welcoming babies and young children is provided with all the necessary equipment: high chair, cot, changing mat, bath, book and games for children. To share moments of conviviality most privileged, we offer our guest table where you can enjoy local and seasonal products. For leisure, guests can explore the rich cultural and natural heritage of our region and enjoy the sites suitable for hiking, biking, water activities…. Most facilities are available in St-Aubin-d’Aubigné or Betton (9km). 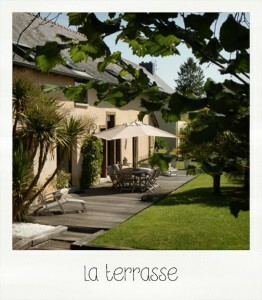 Convenience and comfort are the slogan of La Peuterne to make your stay unforgettable!